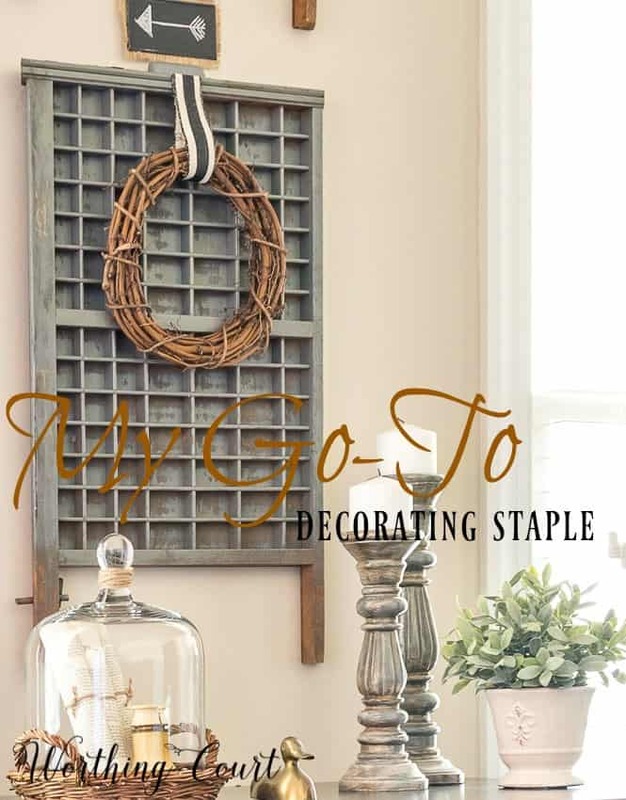 Do you know what one of my favorite go-to home decor staples is? It’s none other than the lowly twig wreath. Twig wreaths pack a lot of bang for the buck! They’re inexpensive, come in a myriad of sizes and they add loads of that all important texture any place that you use them. And they aren’t meant for simply hanging on a door either – there’s so much more that you can do with them! I often like to do something a little unexpected with my candlesticks by placing decorative orbs on top of them instead of candles. 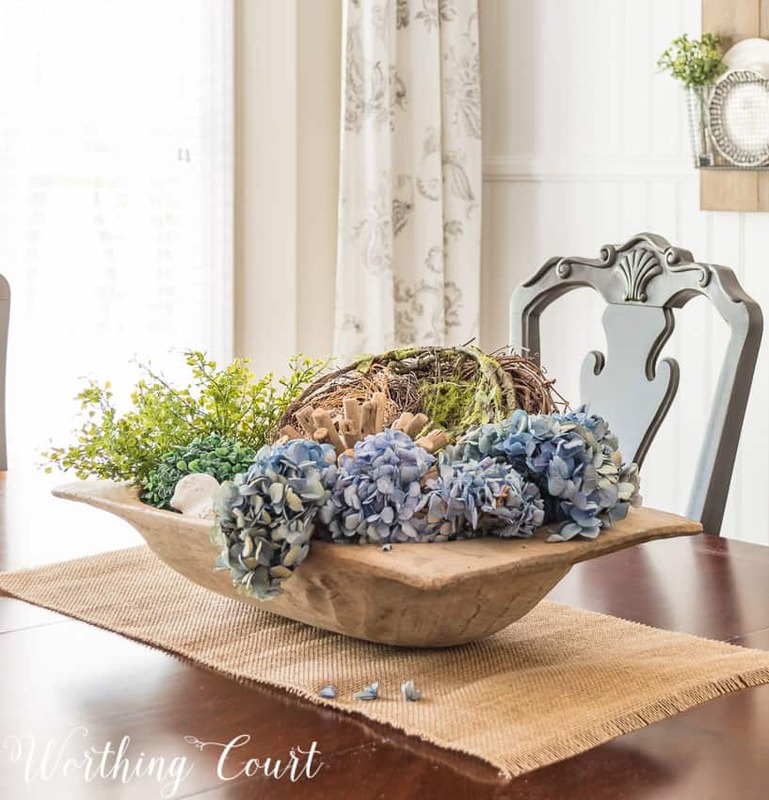 The boxwood orbs that I placed on the candlesticks on my mantel last spring looked a little blah, but when I added a twig wreath it was just that extra little something that they needed. One thing that you’ll see repeated over and over in my home, is a twig wreath added to the front of just about anything. In my office, I used twig wreaths to dress up the front of a couple of vintage printer’s trays. I think the trays would look pretty boring without the wreaths. 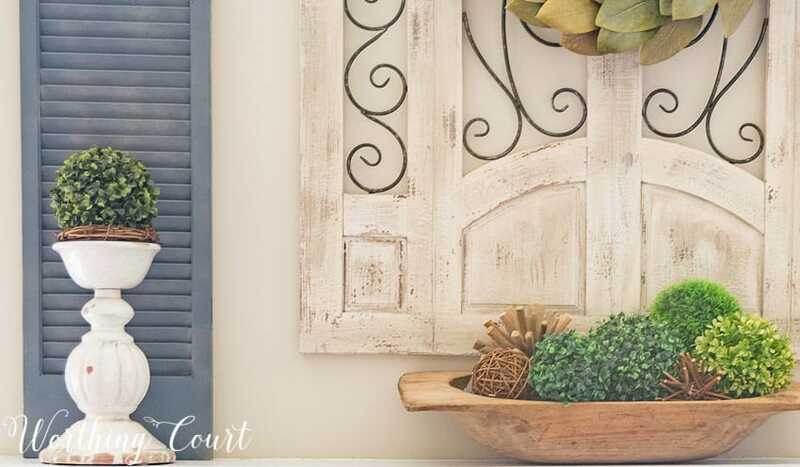 On the gallery wall behind the sofa in my family room, I added a twig wreath to the front of an old shutter. The black and white ribbon that it’s hanging from helps it to pop. 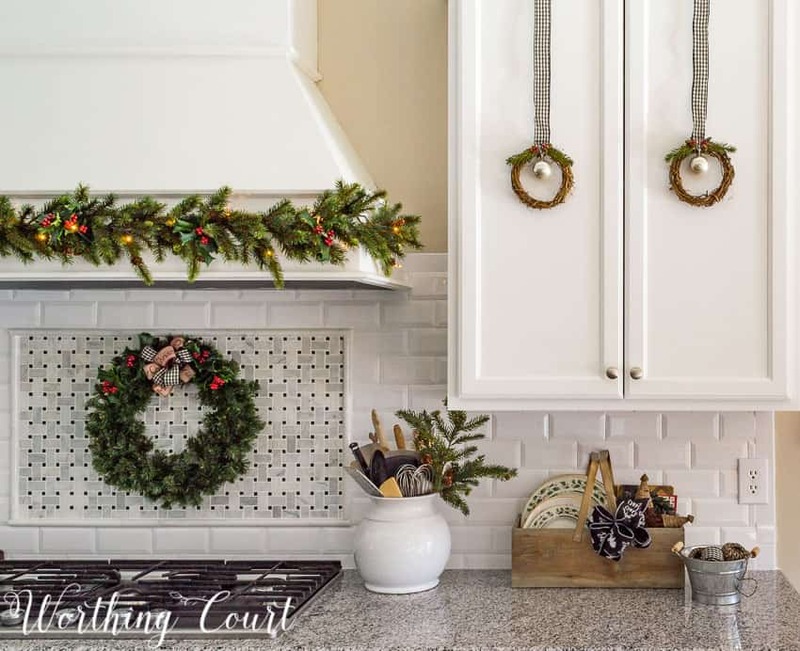 I used twig wreaths hanging from black and white checked ribbon to dress up the front of my kitchen cabinets last Christmas. Each wreath has an ornament hanging inside it and little greenery and berries hot glued to the top. To dress up a framed printable, I even added a small wreath to some greenery sprays that I tied together. It’s hanging from more black and white ribbon and has red berries tucked into the greenery. I’ll say it again – twig wreaths can be used for just about anything! Here I’ve used one as part of the filler in my dough bowl. This dough bowl is rather deep and the twig wreath helps to take up some of the space. Twig wreaths are a no-brainer when it comes to fall decorating. 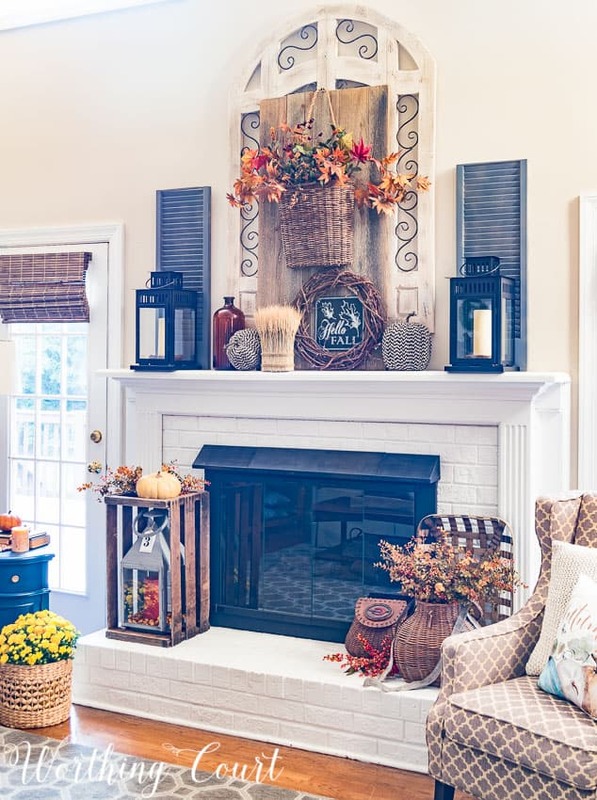 Here, I simply leaned a 12″ twig wreath up against the aged wood boards on my fall mantel. Twig wreaths are great for stacking too! 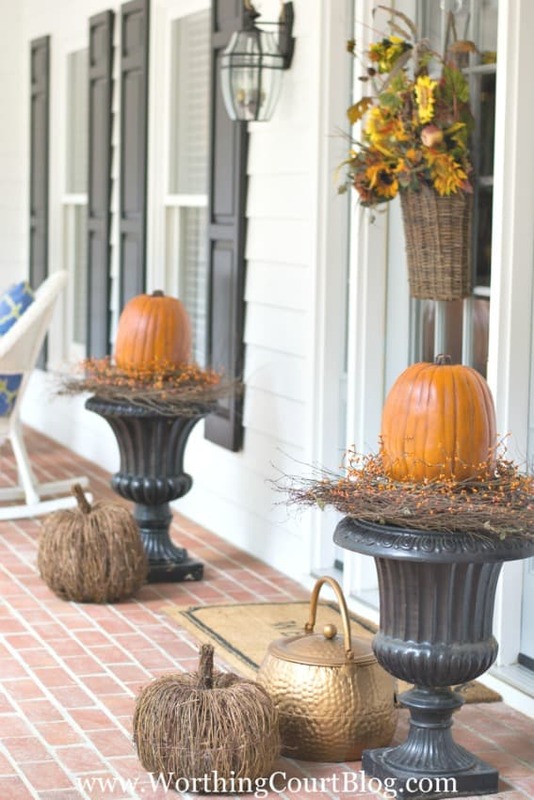 I love, love, love stacking two wreaths together as a topper for the urns on my front porch! The bottom wreath is a spray style twig wreath and the top one is just a regular one. 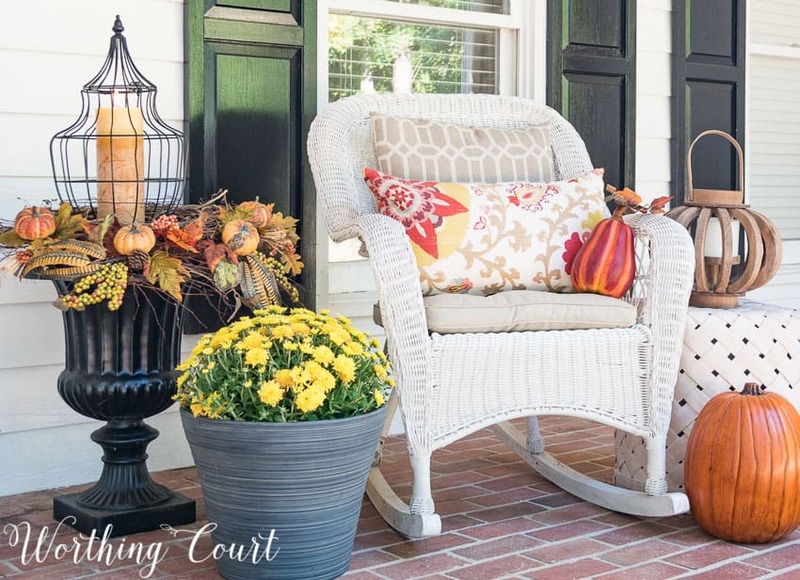 On my front porch this fall, I added a few fall picks wedged into the wreaths. Super easy and they add quite a bit of fall punch! Last year, I dressed them up with just mini berry garland. Very, very simple. In this case, the twig wreaths helped to hold the pumpkins in place. And lastly, I stacked two twig wreaths on top of each other in the tray that I put together for my fall coffee table. These wreaths do a nice job of helping to fill the tray – one wreath was just too skimpy looking. 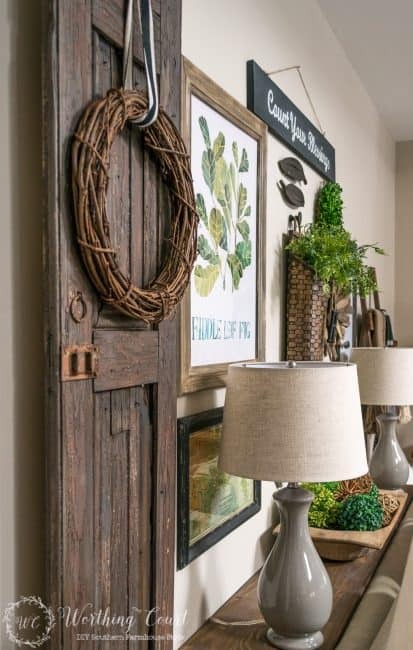 So, if you aren’t already using twig wreaths, other than to hang them on a door, have I made a believer of you? You’ve made a believer out of me, I’ll definitely be using them. Where do you find your twig wreaths? Love the suggestions on how to use them! Good morning! I find most of my twig wreaths at craft stores and sometimes at home decor shops. You can order them from Amazon too. Hope this helps! I love all of your ways to use twig (we call them grapevine wreaths in Tennessee) wreaths. I have several and am going to be using them all over the place now! And thank you so much for visiting with me and letting me feature you lovely home on my blog. Have a great week! beautiful ! beautiful ! i am learning a lot just looking at your photos and by your tutorials. thanks for generously sharing ! Love these ideas, Suzy! I’ll probably be borrowing a few! I love twig wreaths also and will use them. In my fall decor. I like stacking them and will use pumpkins in the center. Nice post Suzy. Loads of inspiration …….thanks so much for sharing……I keep going over and over it all !! I love all the great ideas and pictures that you share! I am currently redecorating a 40+ year old home we built. 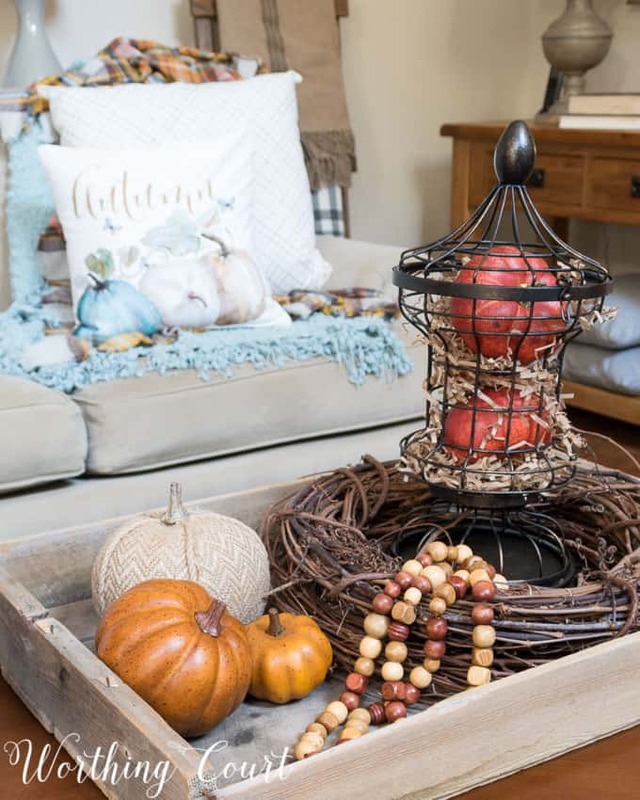 Thank you for sharing many wonderful ways to decorate for all seasons. Well now I must fine a twig wreath. So simple and yet so perfect. I use twig wreaths in my decor, too – love it’s simplicity. I’m inspired by all the ways you’ve used yours. I used one under a pumpkin this year, too, and it has helped to keep it place. Love last year’s pumpkins sitting on wreaths in the urns. The orange berries added just the right touch of extra color. 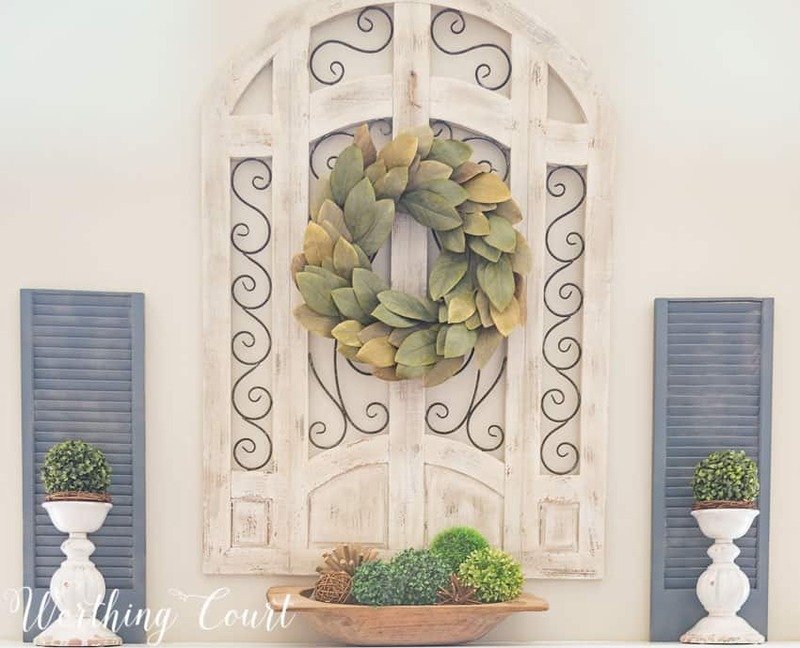 Horizontal wreaths are some of my favorite ways to decorate, also, and I enjoyed seeing yours to give me more inspiration. Love the seasonal decorating ideas. But my favorite is the old shutter you have incorporated into the mixed wall in your family room. Love seeing all your pics. I can’t tell you how much I look forward to reading and enjoying every blog you do, I have a lot of mini wreaths that I use as napkin rings but love the idea of hanging them from the kitchen cupboards. Thank you for all your inspirations. Love the Christmas decorations in the kitchen. Absolutely darling. Do you put anything on the back of the wreaths to prevent scratching as you open and close the cabinet doors? Hi Lorraine. No – I didn’t put anything on the back of them, but I did make sure that there weren’t any sharp points of the back of each wreath. My cabinets have the factory finish on them – I’m not sure if self-painted ones would be more easily scratched or not. I love your Christmas in the Farmhouse kitchen. Just enough decorations. You won’t have to spend hours putting away. I love those big architectural doors over your fireplace! You have a beautiful home!! Thank you for sharing & giving us all this inspiration!!! I love all your decorating ideas!! Thanks for sharing. LOVE your ideas!!! Your home is lovely and so inviting. Love grapevine wreaths. I just don’t use them often. That’s going to change! I love these ideas. 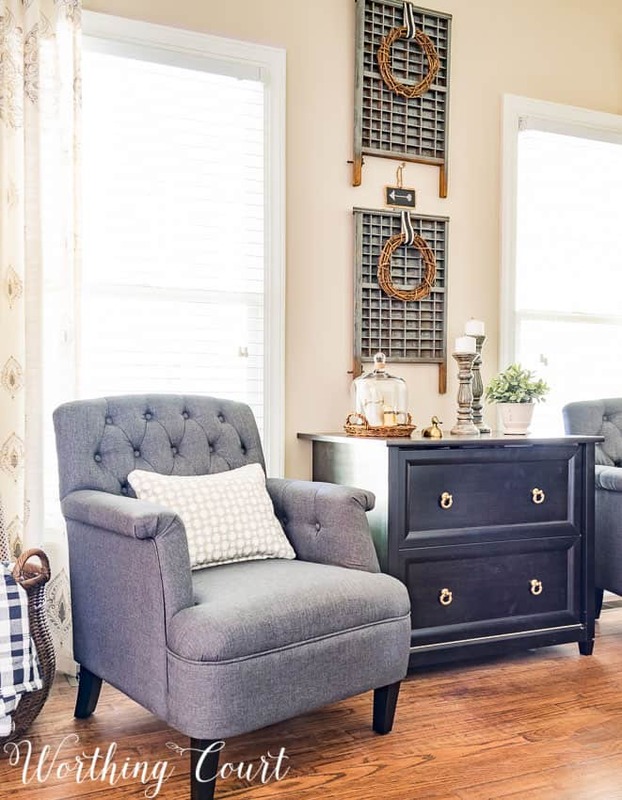 Such a simple item delivers a big punch to farmhouse decorating. I use twig wreaths a lot myself. Always enjoy seeing a new take on an old favorite. Thanks for sharing. Great ideas! I don’t have a twig wreath but I’m going to get some now. Thank you! I have a couple of large twig wreaths that I never really discovered a thoughtful way of using as decor, I can see from your photos how the smaller ones can be oh so handy to decorate with and I will now be getting some of those. Thanks for the tips! You have such wonderful ideas!! 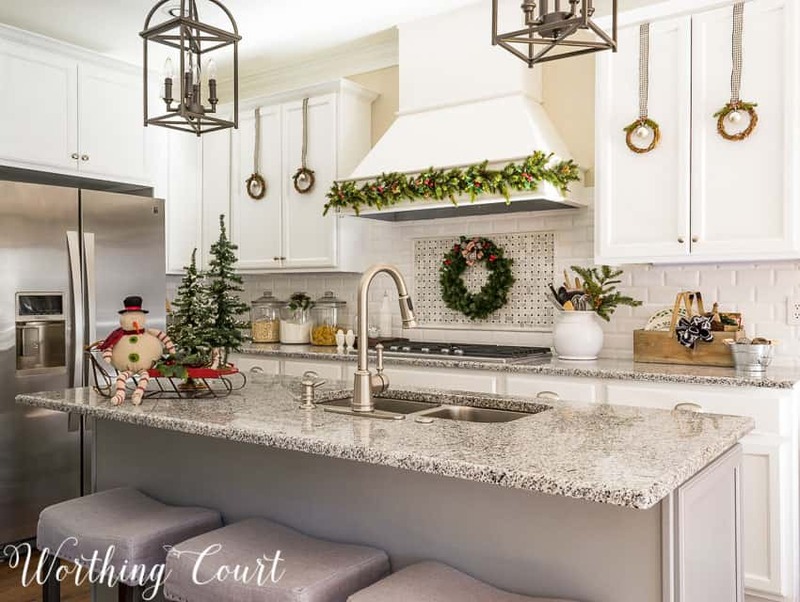 I really love the kitchen Christmas decorations. Thanks for sharing. I use twig wreaths rather absent-mindedly, now I realize the impact they make! My favorite use that you’ve shared are the mini-wreaths under the orbs in your candleholders — just love them! Now I have no excuse for not using the wreath that has been in my garage for five years. I thought they had to be embellished. You are always so inspiring! Yes, twig wreaths add nice texture! Some good ideas! The dining room is to die for! The painted chairs are a home run!!! I agree. Twig wreaths can be used many ways and in any season. Thanks for all of your beautiful, unique examples. 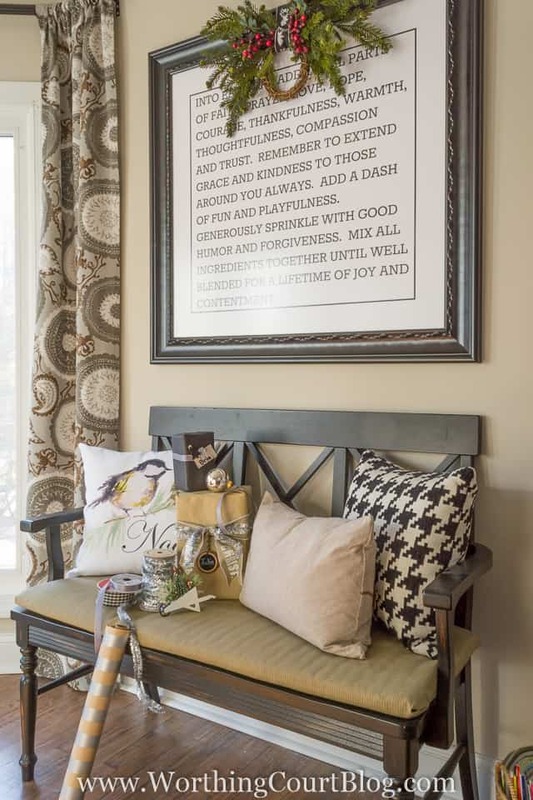 I love how you’ve used the twig wreaths all throughout your home. *runs out to purchase all the twig/grapevine wreaths*! What a smart, simple decoration. I k ow I have some of these tucked in the back of a closet. I currently have twig wreaths in my kitchen and dining room tablescapes. I like to double my wreaths (one smaller, one a bit larger) when I hang them as wreaths. They look more substantial for curb appeal. I love twig wreaths too, you are so right, they are a fantastic staple! You are using it masterfully I should add, very inspiring photos. I have a couple of twig wreaths that I use in my home and I really enjoy them. Hi Cynde. If it’s the pumpkins that I’m thinking of, they came from Target a couple of years ago. Your eye for decorating is impeccable! I love the black wire candle holders on your porch in the urns and also on the coffee table vignette. Do you mind if I ask where you purchased them? Thank you, Deborah! I purchased the candle holders in the urns at At Home last year and the small one on my coffee table came from TJ Maxx (I think!). Love the idea to use a tiny wreath on your candle sticks with the orb. Sometimes I find my candles are too skinny for the candle sticks I want to use, so this is a great idea. Thanks for all your great tips.